The Royal Society says grand-scale geoengineering schemes, like massive tree-planting campaigns or shooting sulfur into the atmosphere to block sunlight, may be needed to stop global warming. Geoengineering may not be a last resort to fight global warming any longer – that is, if us humans can't get our act together to reduce the carbon dioxide we're pumping into the atmosphere. That's the warning that emerged from a Royal Society report published Tuesday. Grand, expensive and uncertain engineering projects – think installing carbon-scrubbing devices across continents or shooting aerosols into the atmosphere to block sunlight – may be humankind's only shot at slowing man-made global warming, the report's authors warn. 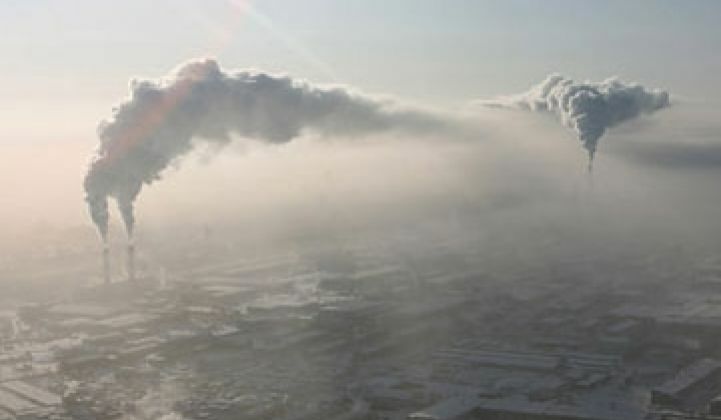 That's because current efforts to reduce greenhouse gas emissions aren't going far enough, the report's authors contend. The world needs to cut atmospheric carbon dioxide levels to half of what they were in 1990 by 2050, but right now, "Global efforts to reduce emissions have not yet been sufficiently successful to provide conﬁdence that the reductions needed to avoid dangerous climate change will be achieved," the report states. "It is hoped that post-2012 emission reduction targets will stimulate greater action through more effective mechanisms," the report went on, referring to the upcoming United Nations talks in Copenhagen to craft a carbon-reduction agreement to replace the Kyoto Protocol (see The Copenhagen Call: Biz Leaders Back GHG Reduction Efforts). "But there is a serious risk that sufficient mitigation actions will not be introduced in time, despite the fact that the technologies required are both available and affordable," the report stated. So, while working toward a huge reduction in emissions, the world's governments should be planning for ways to handle geoengineering projects, the report states. Those fall into two camps. The first, carbon dioxide removal, involves everything from planting lots of trees to fertilizing the ocean to boost the growth of carbon dioxide-absorbing plankton (see Carbon Capture Firm Could Use the Ocean to Combat Global Warming). That would get at the root of the problem of reducing atmospheric carbon dioxide, but is likely to be massively expensive and complicated, the report noted. Of the available choices, ocean fertilization held some of the greatest potential for negative side effects, the report noted. The second technique, solar-radiation management, could be cheaper and faster, the report states. Solar-radiation management includes such schemes as pumping sulfur into the stratosphere to force the same kind of global cooling that has occurred after massive volcanic eruptions (see Green Light post). It could also include projects like painting lots of building roofs white to reflect more sunlight back into space – an idea that's gotten the backing of Energy Secretary Steven Chu, among others. But such sunlight-blocking schemes don't deal directly with carbon dioxide in the atmosphere, and carry the risks of unknown and possible catastrophic side effects, the report warns. Thus, they should only be used if absolutely necessary, the report stated. Given the challenge facing the globe, geoengineering concepts of all stripes have been getting more serious attention from important parties, including the Obama administration, the Wall Street Journal reports. Geoengineering will certainly require an unprecedented level of international cooperation, first on researching which ones will work the best and then on spending the billions of dollars needed to implement them, the report found. But then, so will reducing manmade greenhouse-gas emissions, as the debate over carbon cap-and-trade legislation in Congress has highlighted (see Energy-Climate Bill Could Boost Electricity Costs 20% by 2030).